Discussion in '1940' started by Rich Payne, Nov 3, 2012. 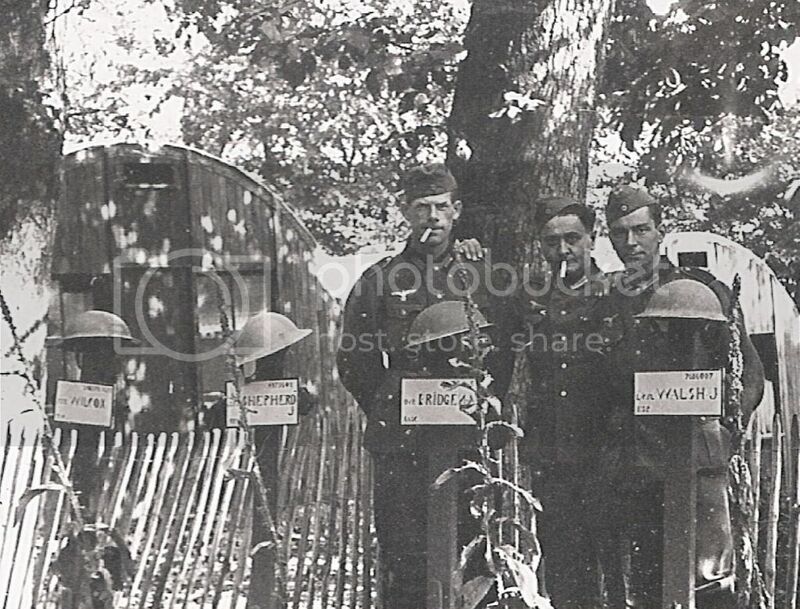 I've recently acquired a period photograph showing German personnel posing behind what appears to be a row of 9 BEF graves and one French with temporary markers. 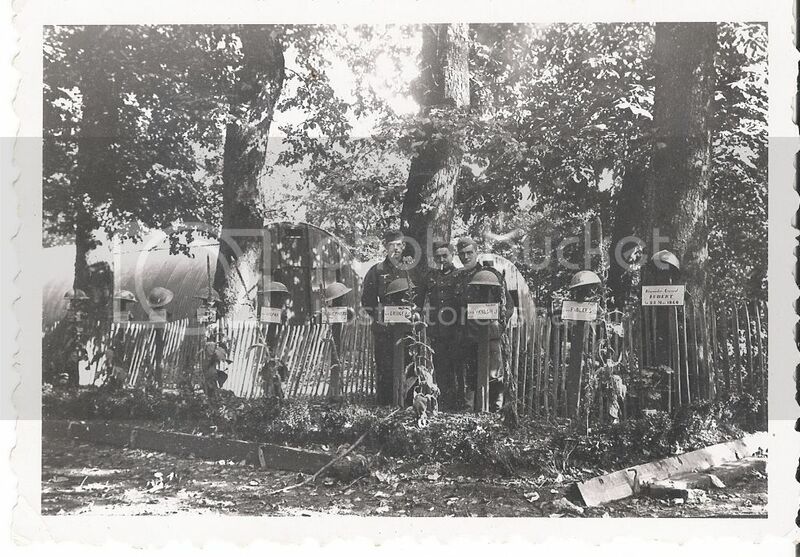 Although the seller's image was not too clear, I've been able to enlarge a number of the names and it has become clear that these casualties now lie in Boulogne Eastern cemetery. Despite the graves being well marked in 1940, at least four of them now lie on a collective grave which appears to hold six casualties. The mixture of units and temporary military buildings in the background suggest that this is probably one of the Boulogne military hospitals and that these casualties died of wounds there. I can read the names Shepherd, J. - Faolkes (Faulks), Wilcox (Willcox) Walsh J .
Shepherd is in the same row. Deacs and dbf like this. Interesting pic Rich , especially as I went there in 2010. I'll let D know about the pic as there Micks in there. I've wondered about that Owen, but it can't surely be coincidence ? There are no J Walshes which fit the bill and this ones father had 'J' as a second initial - it was his mother's initial too. I've also searched all the 007 numbers for May / June and none tie in. Perhaps also oddly, there seems to be an 'FSP' where the grave next to him shows 'RE' and his rank shows as L/Cpl. In the same row in the CWGC cemetery is a CMP casualty - 7686074 - L/Cpl Hackett. Maybe the doubt about the temporary markers was what caused the communal grave to be allocated. Hello Kevin, I'm glad that a link has been made to the photograph all this time after the original post. I have no extra information about your cousin, simply an abiding interest in the campaign of 1940 and a feeling that the information the image contained was too important to disappear into a private collection for another seventy years. I assume that you've found his CWGC entry ? 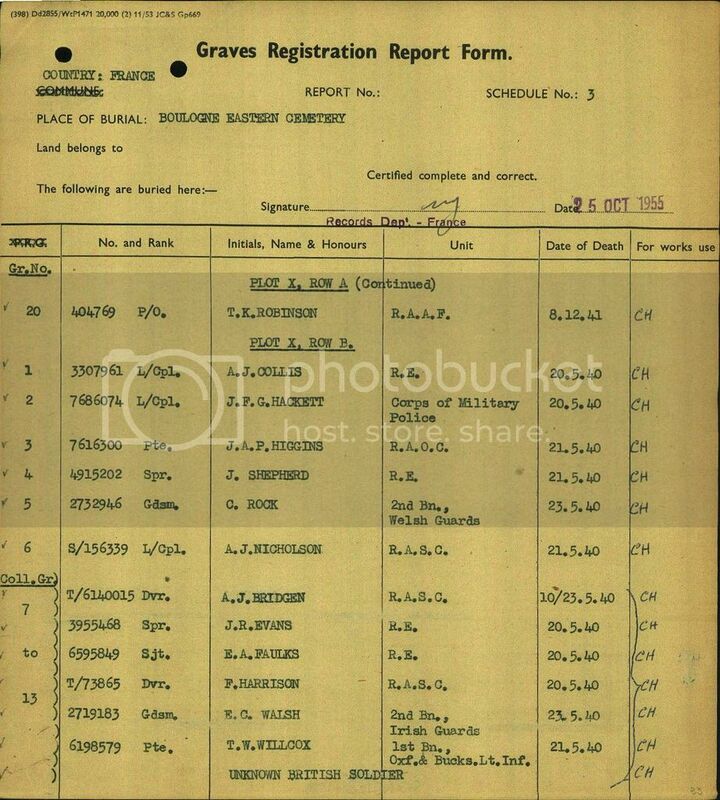 We're fortunate now in that CWGC have uploaded the original Graves Registration Reports and entry from their ledgers. 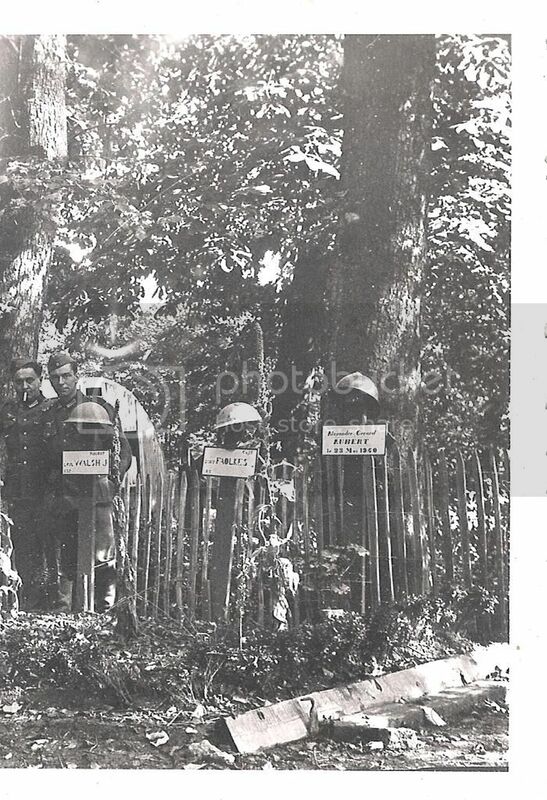 That there is no consolidation report suggests that the casualties had been re-buried in Boulogne Eastern Cemetery prior to the Graves Registration Units having access after 1945. Unfortunately, there is no indication of his unit beyond 'Royal Engineers'. As a 38 year old with the rank of Sergeant, it is likely that he had been a pre-war regular and perhaps recalled to the colours from his reserve service in 1939. Have you considered applying for his service records ? There is a charge but it's a straightforward procedure that we can help you through. The Service Records will normally show which unit he was posted to (Field Company etc.) and from this, in combination with the war diaries held in the National Archives, it may well be possible to come to some conclusions about how he came to lose his life. On 20th May, Boulogne was not yet under attack and the chances are that he died of wounds sustained elsewhere prior to evacuation by sea. Do keep in touch and keep us posted. As an aside, it's not a terribly good idea to post an email address on a forum such as this - 'spambots' will find it and send all sorts of nonsense to you. I see that you've found the 'edit' button ! I've had another go at zooming in and scanning the original but unfortunately it is only 7.5 x 5.5 cm (3" x 2"). I was rather hoping that you might have a photograph of him. There may be one if his death was reported in a local paper at the time. There are others on here who are better at finding that sort of thing. Did he join the Post Office as a Temporary Assistant Postman at 15 and then progress to Sorter when he was 17 or so ? Harry Ree and dbf like this. Harry Ree and Deacs like this. Hi Kevin - If you find out what unit he was with let me know and I'll post the details from his units war diary on here for you. Sadly not enough, Royal Engineers were normally working in groups called Company's and that's the level that the unit war diaries come in. Thank you for posting these pictures. The Sapper Joseph Richard Evans was my husbands grandfather . The picture has great sentimental value for him. 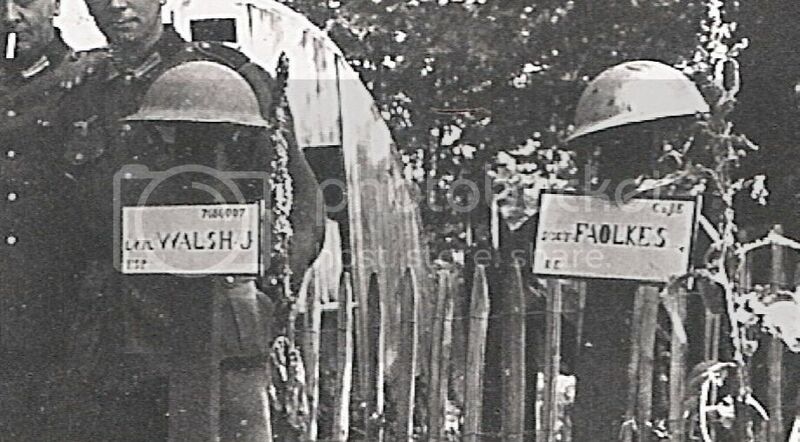 For Kliggs , i believe that Edward Faulks was his sergeant . They were both in the army postal service and were part of 1 base army post office. Joseph had previously been a soldier before becoming a postman when he married. He rejoined when war was declared and was assigned to the royal engineers as a postman / soldier. Drew5233, Harry Ree, dbf and 1 other person like this.